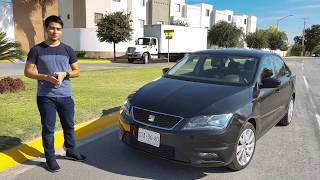 Seat has recently revealed their plans on launching the next Toledo and fortunately, unlike the last model the Seat Toledo 2013 will go back to its roots and will come with a compact sedan form-factor instead of a hatchback. 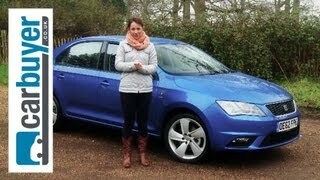 The 2013 model is based on the Volkswagen Jetta but clearly draws inspiration from the Skoda Rapid as well. 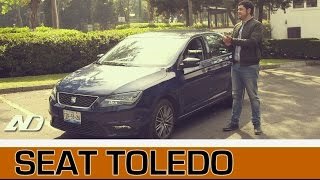 The upcoming Toledo measures 175 inches in length so it's slightly shorter than the Jetta, but Seat claims the upcoming model will offer 17.6 cubic feet of trunk space and a generous hatch. In terms of engine variants the Spanish compact sedan will offer three engines at launch, two of which will run on gas and the other on diesel. However, the carmaker is planning on launching a second TDI engine next year. The smaller gas engine is a 1.2 liter TSI unit able to produce 74 horsepower and 116 g of CO2 / KM. The second petrol unit is a 1.4 liter TSI able to produce 120 horsepower. Moving on to the diesel engine which will be available at launch, the 1.6 TDI unit develops 104 horsepower and 104 g CO2 / KM. Last but not least, if you wish to wait for a more economical diesel engine, the next year's unit will develop 89 horsepower and will evidently yield a better fuel economy than its more powerful brother. In terms of design the compact sedan features clear lines and a clean look both inside and out. Unlike the previous model the new Toledo features less curved lines and delivers a more "grown-up" look. Compared with the previous hatchback model the new Toledo has little to nothing in common in terms of design, and I for one can't complain. The interior is also quite different from the ongoing model and the "shuttle-like" dashboard has been replaced by a more elegant design, which funnily enough looks very similar to the dash found in the VW Passat 2006. 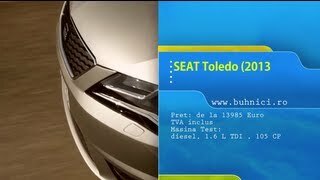 Pricing has not been revealed so far but more information will be revealed once the Seat Toledo 2013 gets closer to its launch on the market. Nevertheless, the price-range should be similar to that of the VW Jetta and the Skoda Rapid. The 2013 model will be first released in Spain and Portugal later this year in November, with the European launch following shortly after in 2013.